If Ari agreed, we'd be eating chicken every night for dinner. I love chicken roasted, baked, broiled, barbecued and poached. This technique of pan roasting chicken before baking it in the oven adds a tremendous amount of flavor to the chicken; It will also add lots of chicken flavor to the rest of the dish, and will keep the chicken juicy without having to over bake it in the oven. Directions: Preheat oven to 425°. Heat 1 tablespoon of the oil in a large ovenproof skillet over medium-high heat. Season chicken with salt and pepper. Working in 2 batches, cook until browned, about 5 minutes per side. Meanwhile, on a baking sheet toss the squash, tomatoes, onion, garlic, half of the cilantro, turmeric, nutmeg, salt, pepper, and remaining oil. Lay vegetables evenly. Once chicken is browned nestle pieces over the vegetables. Pour over chicken drippings from pan. 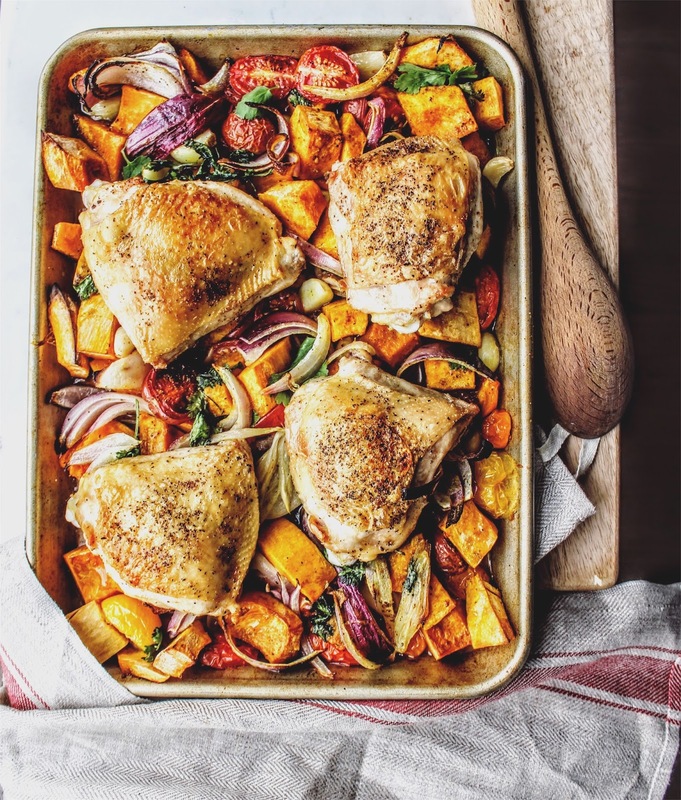 Bake chicken on the middle rack of the oven for 40 minutes until vegetables are cooked through and chicken is soft and golden.